When I planned my travels for the winter of 2014 I did not know what kind of vehicle I would have to travel in. I had first thought of using my Toyota Tacoma pickup truck. I thought I would put a cap on the back of the truck and live in it. I started a design for the interior bed of the truck and went about looking for what cap I would want. I had a list of things I wanted to bring with me and one was a fridge. I had researched and before I had my design for how I was to travel I bought (invested in) a compressor fridge from online reviews. My choice was the high-end Engel compressor fridge for its ability to use so little power. As it turned out I could not find a cap for my Tacoma that I truly liked due to the sloped sides. I was also running out of time to get a vehicle for January and I was lucky to find a 1994 Class B Coachman in nearby New Hampshire that was to be my first year's vehicle to travel in. My Class B had a 3-way fridge but I knew how much work they involve and how much 12 volt power they use so I ended up using the Class B fridge for dry storage and my Engel fridge for cold storage. Here is the tag on the side of my Engel Fridge. My model operates on both 12 Volts DC and 120 Volts AC. I bought this with dual power so I can use it at home as well as on the road. The price tag online from Engel was $800 and $60 for shipping to MA. This was an expense purchase and more than what I wanted to pay, but I saw it as an investment. When not on travel I use my Engel fridge for short and long trips and even for going to the grocery store to put items in that you don't want to spoil or thaw. 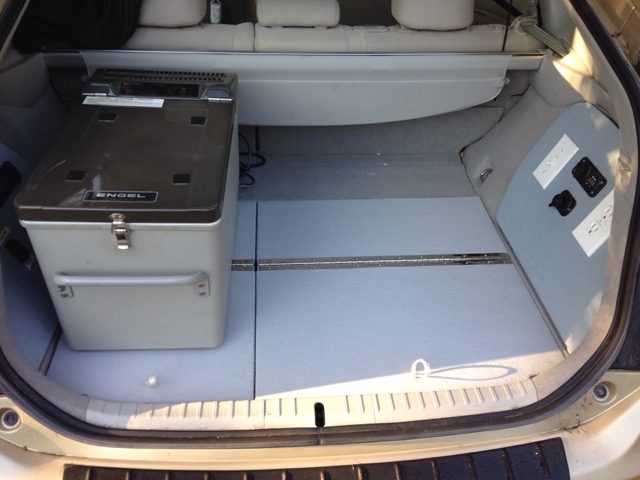 It is well known that compressor fridges are great for vehicle dwelling and they use little power. For me this was my goal, but when I came back from my first year of travel I knew I couldn't sustain the cost of fuel for my Class B and travel the way I want. I could not have been more pleased in planning for my second year of travel and switching to a Prius that my small Engel fridge was just the right size to allow me to continue to have a fridge and have room to sleep along side of it. It fits great under the privacy cover too! From my other blog postings you know that I have done a lot of designing with the Prius including a house battery to power the fridge at night so the Prius doesn't have to run at night. My first year I ran the fridge overnight on 2 12V gel cells at 7 ah each for a total of 14 amp hours. Since you only have use of half the amp hours in a lead acid battery such as these, my Engel fridge got by on 7 amp hours a night! My house battery had limitations the first year in that when I wanted to hike in the morning I hadn't sufficient time to recharge the gel cells before going out, and I stressed the two batteries. My second year of travels in the Prius I upgraded the gel cells to 3 12V 8 ah batteries for a total of 24 amp hours and half of that was 12, and this provided me a much better buffer for my house battery usage. I am currently planning my third year of travels in the Prius and I am working on a whole new house battery design that I will be posting in this blog about soon. I like to cook and eat fresh food. To say I like my Engel fridge is an understatement. It just does what it should. It is not a fridge with lots of gages. It has a knob for setting the temp and there is no temp indicator. I fixed this my first year by using a remote outdoor wireless thermometer from Walmart for $10.00 Other than that it just runs and runs and does it efficiently. How efficient? I didn't know and I decided to perform some tests 3 years after buying it so I could pass the information on to all of you considering a compressor fridge. The tag on the Engel fridge says 2.5 amps running at 12 volts. The high I measued is 2.65 amps when it first starts and then it drifts down to 2.14 before cycling off. 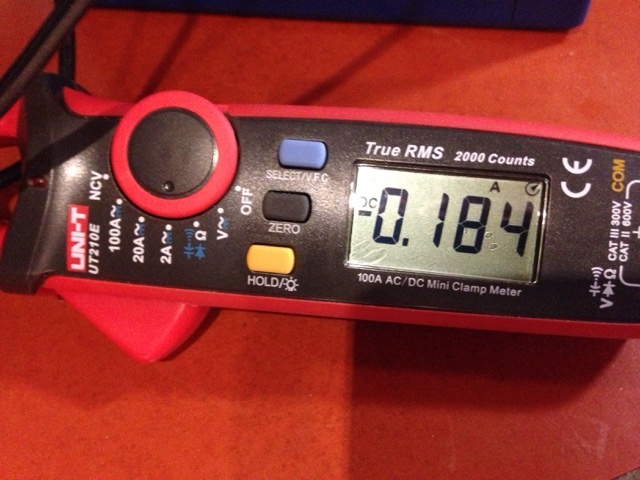 In standby mode between turning on and off the Engel fridge uses from .184 to .125 amps. This powers the circuits and the LED in the 12 volt plug end so you know there is power to the fridge wire, and another LED on the fridge itself to let you know the fridge has power. What does all this mean. Well, I did some duty cycle testing. The fridge has a 11 minute 45 second total on/off cycle under these conditions. So the fridge is off 9 minutes 35 seconds during the cycle. This is a constant on/off that the fridge goes though. If we use the tag on the fridge for amperage draw of 2.5 amps we would have 2.5 amp hours usage if the fridge ran and never shut off. Since the fridge cycles on and off at 22.7% from my measurements the actual usage under these fixed conditions is .57 amp hours. This explains how my fridge ran overnight my first year on the usable 7 amp hour of gel cell battery power (half of the 14 amp hour rating) If I parked at 6 pm and started charging again at 6 am I would have used all the available 7 amps, thus leaving me nothing if I went to hike. I solved this problem of needing more power by unplugging the fridge and not running it during my morning hikes. I always kept a 1/2 gallon of my drink of choice in it and this acted as a good mass to withstand the time during the hike, but then I need to spend time charging in the pm and getting the temp in the fridge back to 35 before night so I could run the fridge at night. All this worrying about battery power and the fridge was distracting and why I added a third battery my second year of travels. This gets me to my new house battery design I am working on to allow more flexibility of power at night. I would like to run other items at night off my house battery such as a USB fan, and with my current design, with only enough power to support the fridge, I can't do this. Of course I have a Prius with all kinds of power since Ready Mode supplies power from the high voltage drive battery to the 12 Volt Prius system allows me to have the Prius run only when it needs to charge the high voltage battery, but I also like to stealth park and running the Prius even in Ready Mode would cause attention. I hope this post explains how well my Engel compressor fridge works and how little power it consumes. I need to add that in January, even in the southwest it is cold at night and mild during the day and there are times that the fridge can be unplugged at night. On the other hand, by mid-March it is getting very hot in the southwest and in the car even hotter. Even with my windows cracked for air circulation, it is hot in the car and the fridge is subject to using a lot more power to keep cool and also because it can't dissipate the heat from the condenser. On these hot days with no shade for hours I may leave my Prius in Ready Mode and leave the air conditioning on (set to a higher temp) to help the fridge through that situation. I do put Reflectix around my fridge leaving the fridge vents open to repel the heat and this works well. I don 't have room for foam insulation around the fridge in my Prius design, but you still have the issue of the dissipating the heat from the condenser. Thanks for the question. You are right that I did not do justice to my rear seating area design and the articulating platforms. When I came home for the summer I put the Prius back in passenger seating mode seen in the following blog. It shows the pieces. This next one shows the way I can access storage under my bed. This last one shows my newest storage design under my bed. I am remiss by not showing the install blog. In the next week or so I will be morphing back to Prius Campervan mode and I will blog on the pieces and the install in detail. Just so you know the seats are removed and there is a lower platform that protects the wires underneath and gives some soft storage. Then the articulating platforms are bolted to the rear seat back swivel hinges on either side. The rest is a bunch of work to have made the platforms to fold and support my weight with only 1/2" plywood. Thanks Brent for the links. Can't wait to see more details. I am also interested in your new house battery, as I need to use a CPAP at night and I would want a small compressor frig. The Prius seems Like a good rig for that. Yours is My favorite set-up I have seen, well done! Tim, Thank you for the nice comments. There are a number of people that use a CPAP machine. The Prius can handle the CPAP and compressor fridge in ready mode without a house battery but the Prius would turn on and off from time to time. 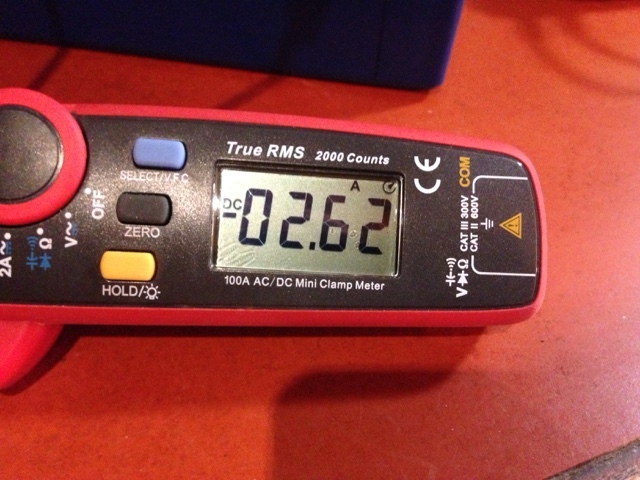 To run both on a house battery you can plan on 1 amp hr for the compressor fridge. There are many CPAP machines and their power can range. If you use a vaporizer that uses more power. If you have one that can run off of 12 volts look up the power it uses as this is how you size your power needs. If it only runs on 120 volts then if you use it it must be with an inverter and they use power in addition to the machine. Of course the CPAP is expensive so I know buying a diffeeent machine is not always possible. Try to figure out your power needs as all house battery systems are designed around power consumption. HI Brent, was wandering about the increase of power you need for your Engel & other goodies, what if you acquire a Renogy 100 watts solar panel it comes with all necessary stuff to just plug it to your batteries. They are light, foldable & easy to carry. Thank you for your question. You are right on with your question. Having a Prius hybrid means we Prius Vandwellers have one of the most efficient generators around with backup battery to supply us power. This means that solar takes a back seat for need. Not obsolete though, as you will see. The Prius ignition can be left on, called "Ready Mode" and it sends power from the high voltage drive battery to the 12 volt battery system. This (12v) is where most of us tie in to get our power. As we use the 12 volt power the high voltage batter resupplies the power until it (the high voltage battery) needs to be replenished. Then the Prius engine/generator starts automatically recharging the high voltage battery. The Prius 12 volt battery is an AGM battery and is small as it only powers 12volt things and doesn't start the car. The car is started with the high voltage hybrid battery. Since the 12 volt prius battery is the life blood of the car I only draw off of it when it is in ready mode. At night when I'm parked I don't want the Prius engine to turn on and off so I designed a separate house battery to supply power overnight for my fridge. 2 years and it has worked for me. I can't get stranded by using the Prius 12 volt battery and forgetting to put the car in ready mode. My desire to change my house battery is to solve a problem of when I hike and don't have sufficient time to fully recharge my house battery. 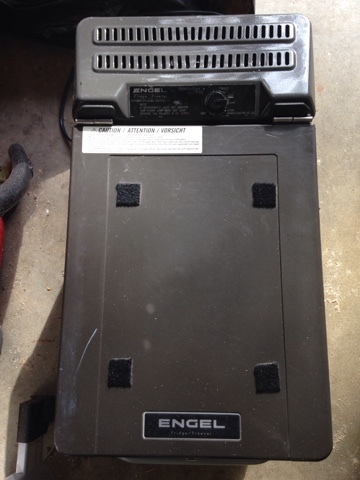 I charge my house battery with a 400 watt pure sine wave inverter tied to the Prius 12 volt battery, but again only run the inverter when in ready mode. It takes a few hours to recharge the house batteries in ready mode. Now for your solar question. Yes the Renology 100 watt folding panel is possible and would work, but as you can see I can charge more quickly with negligible fuel cost. My tradeoff in using that particular solar panel is space. Space management in the Prius is the most important thing for your comfort. The panel just takes up too much room the way it is designed being ridged. If I get a roof rack I loose my stealth image and loose mpg. I am happy to say that I am concluding on testing LiFePo4 battery to replace my gel cell house batteries. In doing this I am planning on testing a LiFePo4 charge controller and a folding 60 watt panel as it folds small. I would use this solar in place of ready mode when parked stationary where I could leave it hanging on the side of the car. I will be posting on these tests in the upcoming weeks. I wonder if you could add a 12 volt fan to the fridge like many do with their refrigerators in rv,s or class b's that might help the condenser cool when its hot in the car. Excellent question. The answer is yes. When I'm in Prius ready mode and have all the power I needed, I would use my USB powered fanni use on myself to blow against the condenser fins to assist the fridge with dissipating compressor heat. My gel cells did not have sufficient power to run the fridge and USB fan for any length of time. Enter my new LiFePo4 battery with plenty of power I will be able to do that when needed. I have been following others that have added fans and I may do this for a more permanent ability in the future.